I wrote and directed a documentary on the Stratospheric Observatory for Infrared Astronomy (SOFIA), an airborne telescope built by NASA and the German Aerospace Center (DLR). It was filmed on site at NASA Ames Research Center in Northern California. The film was the centerpiece of a multi-year project to create educational materials showing how spectroscopy, the study of light interaction with matter, impacts everyday life. Skysight was funded by the NASA National Space Grant Program, aired on PBS affiliates, and is in active use in high school and college classrooms. SOFIA’s 100-inch telescope is the same size as the Hubble Space Telescope, and from 45,000 feet above the Earth’s surface, it can detect infrared light that’s invisible to ground-based telescopes. Because it returns to the ground after each observation mission, SOFIA gives scientists flexibility to change equipment and location, depending on what they’re observing. For instance, while SOFIA is based in California, the 747 spends several weeks based in New Zealand to observe the universe from the southern hemisphere. From 2001-2005, I led a grant-funded project to create science learning materials in which consumer, industrial, medical, and scientific applications of spectroscopy are highlighted, and each example leads to an in-depth description of the underlying science, along with study questions to facilitate individual comprehension and classroom discussion. The project was funded by the NASA National Space Grant Program, featured in the journals Science and Chemistry International, and used by universities, research institutes, and companies in 20 countries. Any object will emit some infrared radiation (IR), depending how hot it is and what type of material it is made from. This phenomenon allows us to see things that are not otherwise visible to the unassisted human eye. Thermal infrared imaging is used by NASA for earth bound satellite observation, and by meteorological satellites, which can see through various weather conditions, and detect differences in temperature between clouds, sea and land. The image on the left shows two photos side by side. The left image is a visible light photo of the 1998 Yellowstone National Park fire. 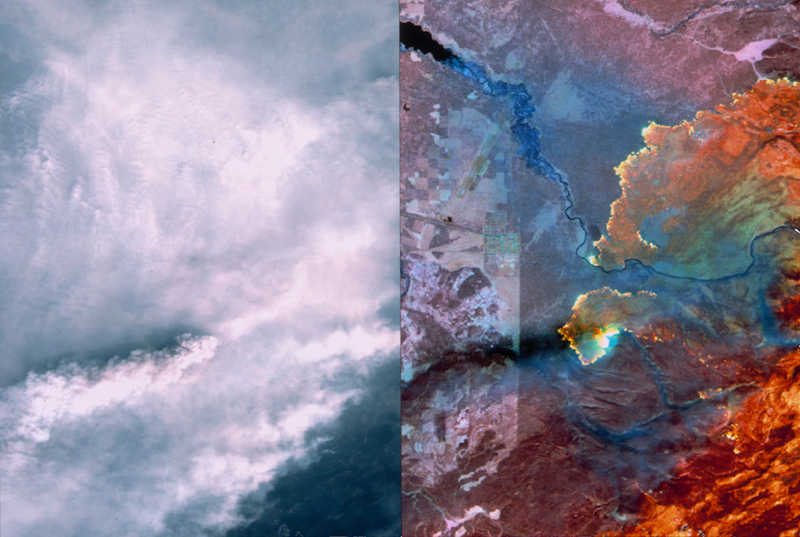 On the right is a thermal satellite image, which can “see” through the smoke to show extremely hot regions of land where fires are burning. This can help firefighting crews focus their efforts, including evacuation procedures, fire containment lines, and airdrops of water and flame retardants. Infrared light is used in other everyday applications including toaster ovens, broilers, night-vision, and F.L.I.R. (forward looking infra-red). In the science lab, organic molecules can be identified using infrared spectrophotometry, because IR radiation causes distinct functional groups to vibrate at various frequencies, allowing scientists to identify them. Infrared (IR) causes polar molecules to undergo bond vibration. This vibration causes material to become hot, which is why you feel hot when in strong sunshine. Introduced in the early 1980s, MRI has been called one of the greatest medical achievements since the development of X-ray imaging techniques. MRI stands for Magnetic Resonance Imaging, which is fundamentally the same as Nuclear Magnetic Resonance (NMR) spectroscopy, the analysis technique based on radio waves that is widely used in chemical analysis. The primary advantage of MRI is that it is a non-invasive technique and unlike CT scans it does not use X-rays which may pose the risk of radiation injury. Like proton NMR, MRI allows three-dimensional images of the soft tissue in the brain, eyes and spinal column to be produced by applying radio-frequency (RF) waves to water molecules present in soft tissue, which line up in an applied magnetic field. While in the magnetic field, the subject under examination can be irradiated with RF from multiple angles to produce a three dimensional “illustration.” MRI can also be used to image blood vessels and provide insight into the chemical components of selected tissues. fMRI or functional Magnetic Resonance Imaging is a new technique which employs MRI to measure the hemodynamic response (changes in blood oxygenation and flow) that correlates to neural activity in regions of the brain. Because of its ability to give researchers quantitative information about how the brain responds to stimuli, fMRI is emerging as a strong complement to the self-reporting of thought and emotional response by research subjects. Martin Paulus, a neuroscience researcher at the University of California, San Diego is using fMRI to study the potential for clinically important predictions in medicine. Perhaps the ultimate example of science making its way into everyday life: Microscopy is mentioned in an episode of the NBC sitcom Frasier. Roger: [v.o.] Well, I had a really good year. I decided hey, why not reward myself? So I bought what I really wanted – a forty-eight foot cabin cruiser. Want to know how much it cost me? I’ll tell you how much it cost me: three hundred grand, not to mention the twenty thou for the custom teak decking. Now, here’s my problem: the wife wants to call this incredible vessel Lulubelle, after her mother. Lulubelle! So I say, “no, we call it the Intrepid.” So what do you think it should be called? Lulubelle or the Intrepid? Frasier: [after a beat] Roger, at Cornell University they have an incredible piece of scientific equipment known as the tunneling electron microscope. Now, this microscope is so powerful that by firing electrons you can actually see images of the atom, the infinitesimally minute building blocks of our universe. Roger, if I were using that microscope right now… I still wouldn’t be able to locate my interest in your problem. Thank you for your call. Modern microscopy is a very important tool in many scientific fields, particularly in materials science. Techniques include Atomic Force Microscopy (AFM), Scanning Electron Microscopy (SEM), Scanning Tunneling Microscopy (STM), and Transmission Electron Microscopy (TEM). Each of these techniques gives the scientist different information about their sample. SEM is by far the most widely used form of microscopy. Why is it so much better than the visible light microscope? Electron microscopy is a result of the wave behavior of accelerated electrons. The visible light wavelengths are from 4,000 to 7,000 Angstroms, while electrons accelerated to 10,000 KeV have a wavelength of 0.12 Angstroms. This huge difference in the wavelengths of the light mean that generally, electron microscopes can resolve much smaller details on a sample surface than light microscopes. The diffraction of light limits the resolution of optical microscopes to 1000x magnification, but electron microscopes, which are not affected by visible light, are limited to 1,000,000x magnification. Scanning electron microscope resolutions are currently limited to around 25 Angstroms. Because of the abilities of modern electron microscopes, it is possible to generate accurate representations of the surfaces and structures of matter as small as a few microns in size. Microwaves are a form of low energy radiation that cause polar molecules like water to rotate rapidly, causing frictional heating. The microwave oven was designed to take advantage of the the absorption of microwaves by water molecules, which causes the water molecules to undergo rapid rotation, creating a lot of friction that heats up the food and causes it to cook. in the absence of microwave radiation, polar molecules like water tend to rotate randomly. The sine wave nature of microwave radiation makes the molecules oscillate back and forth, and as the energy of the microwaves increases, the water molecules oscillate more rapidly. In a typical microwave, this is on the order of 2450 million oscillations per second. A popular misconception is that microwaves cause food to cook from the inside out. This is not true, since microwaves can only penetrate a few millimeters into food, depending on its density. This is where cooking actually begins, and the heat travels into the food gradually. Very dense foods, or poor conductors of heat may not actually fully cook in the center. The device inside a microwave oven that generates microwave radiation is called a magnetron, and as with many scientific discoveries, its ability to cook food was discovered by accident. In the 1940s, the American engineer and physicist Percy Spencer was working with defense contractor Raytheon to produce combat radar equipment to be used in WWII. One day, while working near an active magnetron, he noticed that a candy bar in his pocket had melted. Spencer was not the first to notice this phenomenon, but he was the first to investigate it with additional foods, including popcorn and an egg. Later, he built the first microwave oven by attaching a magnetron to an enclosed metal box, and continued to perform experiments with various other food items. Spencer filed a patent application on October 8, 1945, and the first commercially produced oven was made available in 1947. Ultraviolet (UV) causes sunburn. Ultraviolet/Visible spectrophotometry is used primarily to identify how much (quantitative analysis) of a substance is present, usually in a solution. The color absorbances are used with the Beer-Lambert Law. X-rays can cause ionization by actually removing an electron from the atom. They have a lot of energy, enough to travel right through the body, so they are used to see inside the body for CT scans and X-rays. X-ray spectroscopy is used in surface science or materials science to analyze the top few atomic layers of a substance to determine chemically what elements are present, as well as the chemical structure. This curriculum meets the following National Science Education Standards, as set forth by the National Academies. This project is based on the idea that building a network of people is critical for the long-term and sustainable success of technology in teaching and learning. The program of study in science for all students should be developmentally appropriate, interesting, and relevant to students’ lives; emphasize student understanding through inquiry; and be connected with other school subjects. The program of study should include all of the content standards. Science content must be embedded in a variety of curriculum patterns that are developmentally appropriate, interesting, and relevant to students’ lives. The program of study must emphasize student understanding through inquiry. The program of study in science should connect to other school subjects. All students in the K-12 science program must have equitable access to opportunities to achieve the National Science Education Standards. Develop a framework of yearlong and short-term goals for students. Select science content and adapt and design curricula to meet the interests, knowledge, understanding, abilities, and experiences of students. Select teaching and assessment strategies that support the development of student understanding and nurture a community of science learners. Work together as colleagues within and across disciplines and grade levels. Structure the time available so that students are able to engage in extended investigations. Create a setting for student work that is flexible and supportive of science inquiry. Make the available science tools, materials, media, and technological resources accessible to students. Identify and use resources outside the school. Engage students in designing the learning environment. Gourlay, B., Kanig, D., Lusk, J., and Mader, S. (2006). Chemistry Language Project. Brown University. We built a source of information to help graduate students learn how to use technical terms in their proper context in a chemistry lab. This project is the subject of a chapter in the recently-published book Authenticity in the Language Classroom and Beyond: Adult Learners. Mader, S. (2005). OpenSpectrum: A Wiki-based learning tool for Spectroscopy that anyone can edit Paper presented at the Winter 2005 CONFCHEM: Trends and New Ideas in Chemical Education – an online conference Jan-Feb 2005. Mader, S.L. and Muppidi, S.R. “The Science of Spectroscopy: Building Faculty Collaborations, Enhancing Student Engagement” MERLOT International Conference, Atlanta, GA. – research presentation: 29 September 2002. Mader, S.L. and Rooke, M.A. “Web-based Virtual Instruments” Division of Chemical Education, American Chemical Society 224th National Meeting – research presentation: Boston, Massachusetts. 22 August 2002. Rooke, M.A and Mader, S.L. “Creating Active Learning in Introductory Chemistry: Combining Just-in-time Teaching with the Blackboard Course Management System” Division of Chemical Education, American Chemical Society 224th National Meeting – research presentation: Boston, Massachusetts. 21 August 2002. Mader, S.L. “Web-based Interactive Learning Modules: The Science of Spectroscopy” ‘Technology, Pedagogy and Course Redesign’ Conference, Fairfield University – research presentation: Fairfield, CT. 12 June 2002. Canistraro, H. A., Mader, S.L. *, and Rooke, M.A. “An Action Plan for Strengthening Undergraduate STEM Education” Project Kaleidoscope: “The World Wide Web: Strengthening the Undergraduate STEM Curriculum” U.S. Air Force Academy, Colorado Springs, Colorado. 11 February 2002. Rooke, M.A. and Mader, S.L. “Web-based Molecular Modeling and Spectral Interpretation” American Chemical Society: Northeast Regional Meeting (NERM), University of Connecticut, Storrs, CT. 21 June 2000. Mader, S.L. and Rooke M.A. “Web-based Spectroscopy Education: Spectral Interpretation” American Chemical Society – Connecticut Valley Section Undergraduate Research Symposium – research presentation: 29 April 2000. Mader, S.L. “Web-based Spectroscopy Education” University of Hartford – Undergraduate Research Colloquium – research presentation: 14 April 2000. Rooke, M.A. and Mader, S.L. “Web-based Spectroscopy Education” American Chemical Society 219th National Meeting – research poster: San Francisco, CA 29 March 2000. “Shedding Light on Spectroscopy” Science, 297: 1775 (13 September 2002). “Seeing the Scientific Light” The Observer (University of Hartford), Vol.26, No.4: 7 (2000).